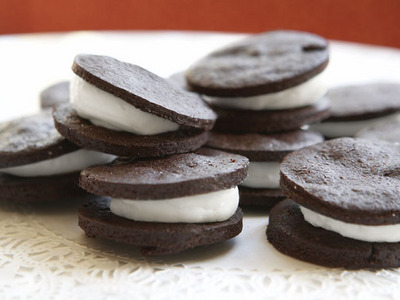 Oreo Cookies – PUT THAT IN MY FACE. 1. In a medium bowl, whisk the butter and the sugar until combined. Whisk in the vanilla and melted chocolate. Add the egg and stir until well blended. 2. In another bowl, combine flour, cocoa powder, baking soda, and salt. Stir to blend them. Using a wooden spoon, stir the flour mixture into the chocolate mixture. The finished dough should feel like Play-Doh. Cover the dough with plastic, and set aside for 1 hour or until firm. 3. Place the dough on a long sheet of parchment paper. Use your hands to shape it into a rough log, about 10 inches long and 2 1/2 inches in diameter. Place the log at the edge of the parchment. Roll the parchment around the log. With your hands on the paper, roll the dough into a tighter log, keeping the diameter the same. 4. Refrigerate the dough for at least 2 hours, or until it is firm enough to slice without crumbling. 5. Set the oven at 325 degrees. Line 2 baking sheets with parchment paper. 6. Remove the dough from the paper. Cut the log into 32 slices, each a quarter-inch. Set them on the baking sheets 1 inch apart. 7. Bake the cookies for 20 to 25 minutes, checking them often after 15 minutes, or until they are firm when touched in the center. 8. Cool completely on the sheets. 1. In the bowl of an electric mixer, beat the butter on low speed for half a minute. Add the vanilla and confectioners sugar and beat until smooth. 2. Beat in the milk and salt. The filling will look and feel like spackle. 3. Place 1 tablespoon of filling on the flat side of 16 cookies. Press the remaining 16 cookies on the filling, flat sides against the cream, to evenly distribute the filling.